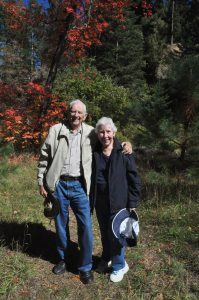 This entry in my blog was written by my wife, Louise, telling the story of a recent trip up the mountain to see the fall colors. “On Friday we decided to drive up the Catalina Mountains to see how the colored leaves were doing. Several earlier trips had whetted the appetite and seemed to promise more and better to come. With a free morning ahead of us, we climbed into the car and headed up the mountain. We saw some beautiful trees with vivid yellow leaves near the bottom levels of the mountain, then miles of lovely evergreens and other trees. 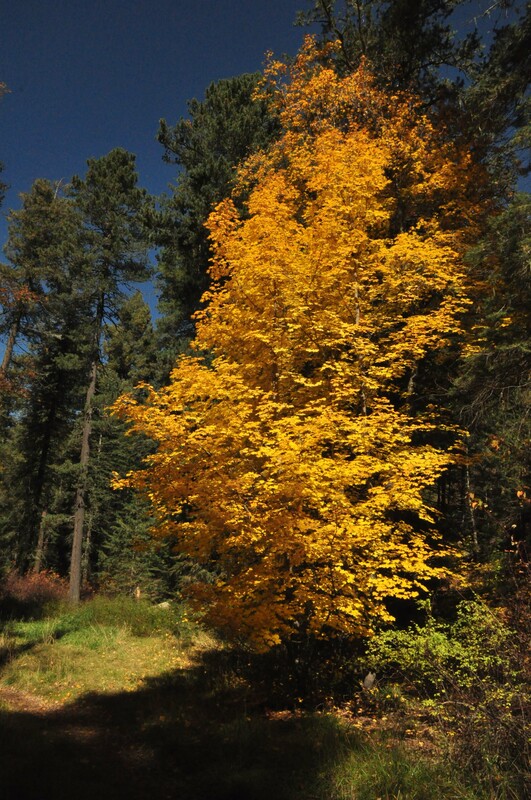 As we approached Bear Wallow, at mile post 22, there were more and more trees in color, almost all of them shades of yellow. We parked and walked down into the Wallow, rejoicing at the vividness and variety of the yellows. One tree in particular stopped us in our tracks with it high-impact golden color, which seemed to have a life of its own. Frank was taking numerous photographs. There were a good number of fellow-color-seekers on the trail, all ages, carrying children, cameras and binoculars. 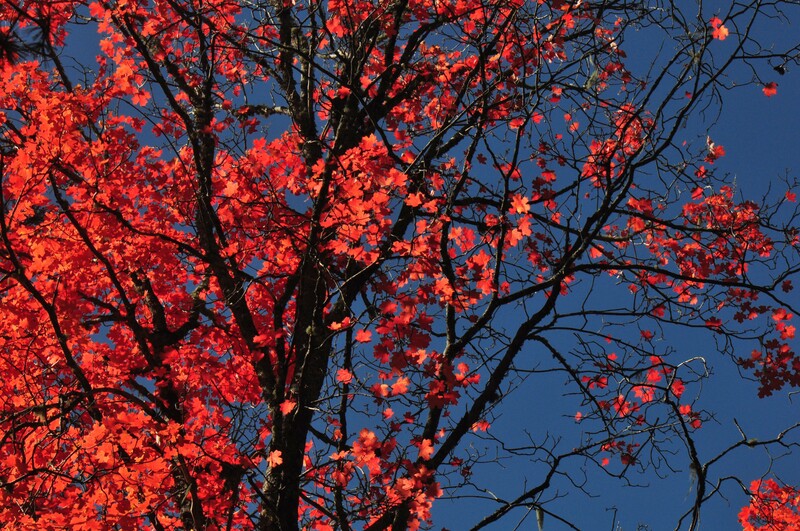 Half way along we came to what our hearts were looking for – a bright red maple, a burst of flaming glory in the midst of the yellow and green. A whole flock of people were gathered in the clearing near the tree. 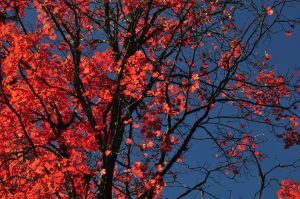 When you looked up at the top of the tallest branches, the contrast between the glowing red of the leaves and the gorgeous blue of the sky was striking. A smiling young woman kindly asked if we would like her to take our picture in front of this spectacular tree. We happily posed for her and she clicked this picture. Along came a group of familiar hikers, calling out Frank’s name and waving copies of his book. As you drive up the Mt. Lemmon highway you soon leave the Saguaros behind and come into a landscape with oaks and a number of different shrubs. 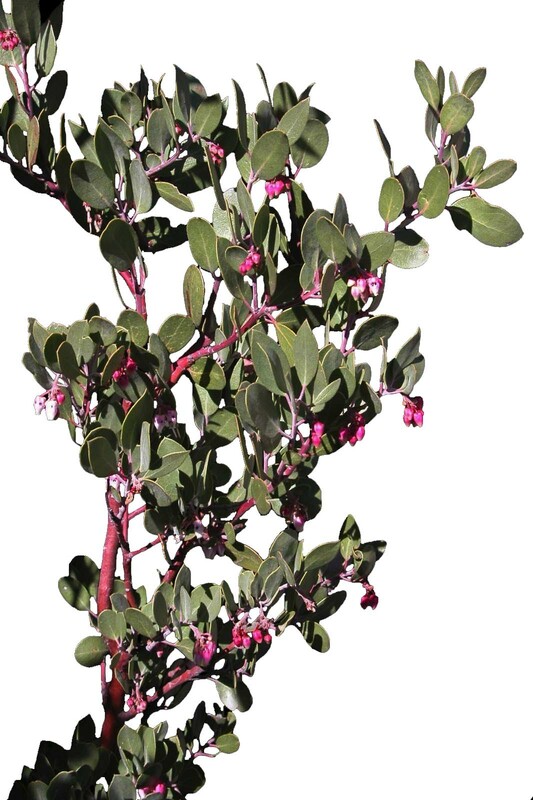 One of the most beautiful shrubs is called: Manzanita – a Hispanic name meaning “little apple”. The botanical name, arctostaphylos, comes from two words meaning “bear grape”. In the Spring and early Summer it is covered with beautiful pink or white flowers, shaped like little bottles. 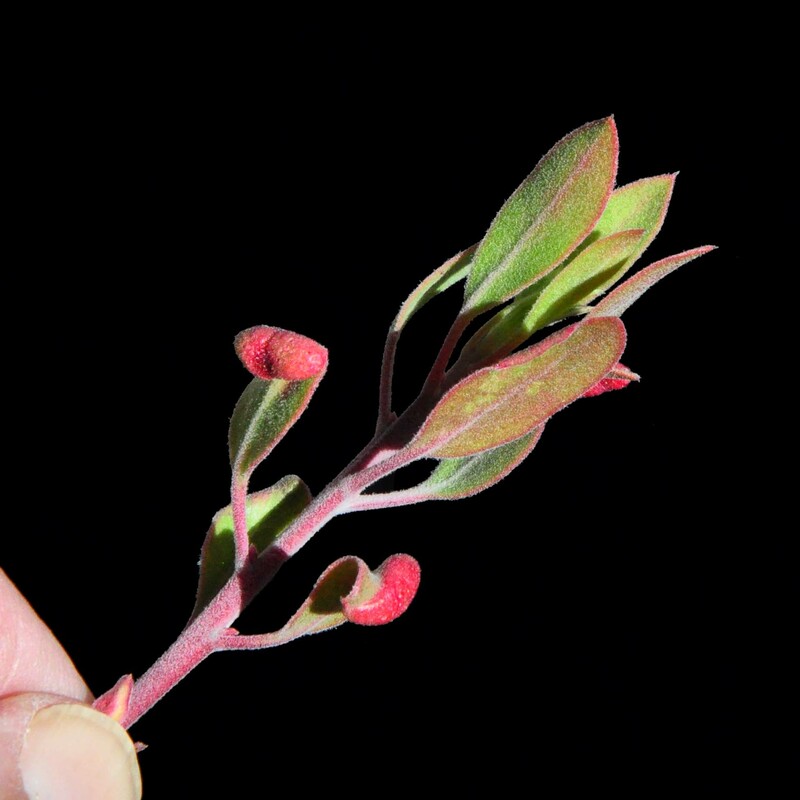 On a recent plant walk, we noticed bright red shapes on the leaf margins of a manzanita. We suspected that these shapes were galls. My friend, Larry looked it up in a book about galls, and told me that it has its own name: Tamalia coweni. 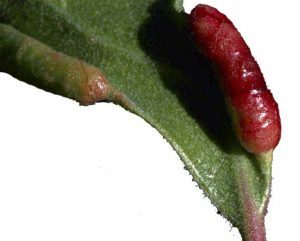 Galls are an abnormal growth that plants create in response to the activity of little critters, like tiny wasps or, in this case, an aphid. The aphid gets on a leaf margin, and somehow tricks the plant into growing in an unusual way. The portion of the leaf with the aphid, swells, and the edge of the leaf rolls over. At first this growth is green. After a while it turns bright red. This is my photograph of a leaf with two galls, one red and the other green. When we sliced the green gall open, we saw aphids inside, barely visible in the picture below. 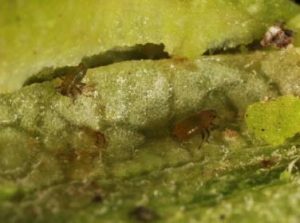 The aphids lay eggs which develop into adults that emerge from the leaf when they are ready. We have seen galls on other plants, especially oak trees. Galls come in many different forms, all serving as a place where eggs are protected and fed on their way to their full development.